The Hubbard Free Library is housed in the oldest library building in Maine still serving its original function. 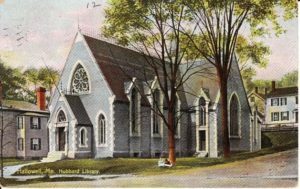 Designed by local architect Alexander C. Currier to look like an English country church, the library was dedicated in March, 1880, as the Hallowell Social Library. In 1893 General Thomas H. Hubbard of New York City, a Hallowell native, donated $20,000 for the construction of a free library. The money was used to build an addition to the existent building, in the form of a cross-axial transept, in keeping with the original church design, and the library became the Hubbard Free Library. A second addition was added in 1897, with money donated by Mrs. Eliza Lowell of Hallowell. 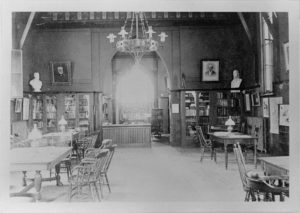 Reading Room, circa 1880 On the National Register of Historic Places since 1970, with an impressive collection of historic artifacts and archival materials, the library today is also a vibrant and much-cherished participant in the life of the communities it serves. Overseen by a 13-member Board of Trustees, the library receives partial funding from the city of Hallowell; residents of this community may have free library cards. All others must pay a yearly non-resident fee of $40. The library has three desktop computers available for public use, contingent upon observance of the library’s Computer Use Policy. It also has wireless connectivity. The library also offers the following: Inter library loan program, fiction and non-fiction books, audio books, DVD’s, VHS tapes, magazines, Kennebec Journal, biographies, children’s books, children’s toy section, displays from the Vaughan Homestead, young adult books, and an active book club. Adult and children’s programming is presented throughout the year, including a Children’s Story and Craft Hour for 2-5 year olds (younger and older siblings welcome), Wednesday mornings, 10:30-11:30. There is also a Summer Reading Program for children ages six thru twelve. Our staff includes a part-time director, and four part-time staff, who all wear many hats, though each has his or her special area of expertise. The Board of Trustees meets the 2nd Wednesday of each month at 6:00 p.m. at the Library, 115 Second St., Hallowell, ME 04347.